Feet are comprised of many irregular shapes making them one of the most difficult body parts to draw. 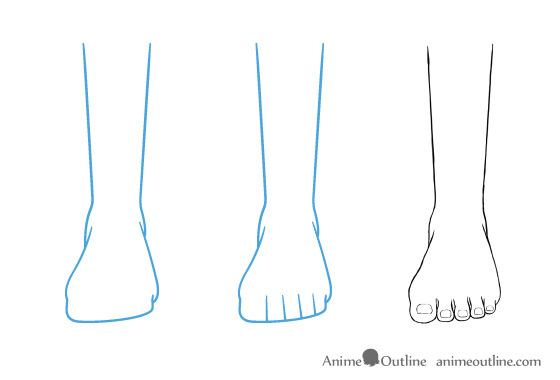 Anime feet just like many other body parts drawn in anime style are simplified versions of real feet. 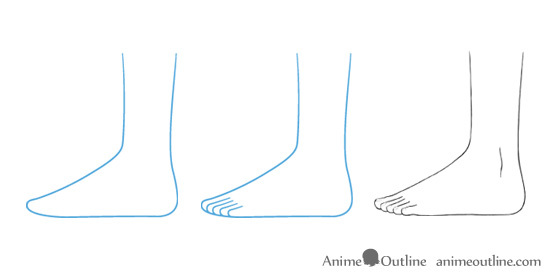 This tutorial provides some useful tips along with examples that can help you learn how to draw feet in the anime anime and manga styles from different views. 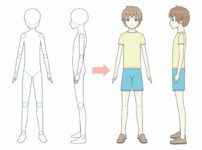 Anime feet tend to be less stylized (closer to real feet) than some other other anime styled body parts. 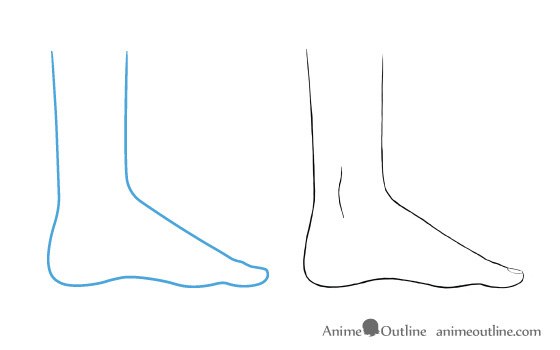 The size and shape of feet can vary based on many factors but the same principles can apply when drawing all feet. 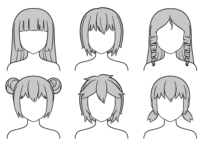 For the sake of this tutorial we will draw the feet of what would probably be those of a young adult. 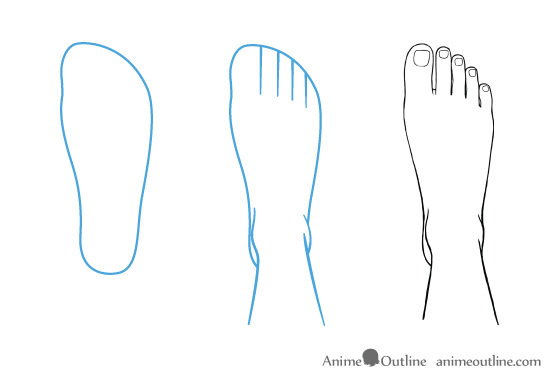 For feet in any view always start by drawing the overall shape of the foot. Leave the smaller details like the toes and toenails for after you do this. You want to get the overall proportions of the foot first. 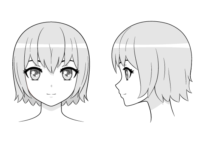 This will help you avoid mistakes when drawing the details. 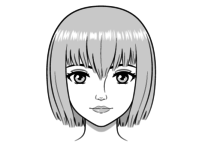 Drawing a rough overall shape of your subject first is a good rule for drawing in general. This is a good view to start with as it lets you see a lot of the foot. As mentioned above start by drawing the overall outline of the foot first. The foot will be wider towards the toes and narrower towards the heel. However the overall shape of the combined toes will narrow slightly going from the base to to tip. Pay attention to the proportions to make sure the toes are properly sized in relation to one another. The big toe will obviously be the largest (about twice as wide as the other toes). 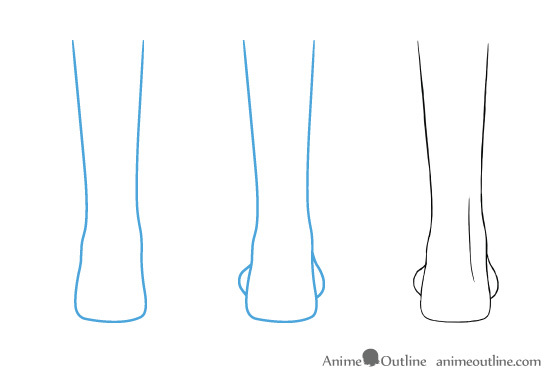 Drawing anime feet from the bottom view is very similar to drawing them from the top view (you can follow the instructions above). 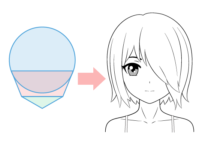 One thing you may want to keep in mind when drawing feet from the bottom view is that it will most often mean that the feet are not standing on a surface (unless it’s transparent). This means that the small toes may curve slightly more downwards and appear a little shorter. When drawing the foot from the small toe side all of the other toes will be visible regardless of the view angle. In the side view draw the foot like a slope going higher up towards the heel and lower down towards the toes. If you are drawing the foot close to eye level like in this tutorial from the big toe side of the foot than the other toes will usually not be visible. When drawing the foot from this side be sure to draw an arch between the toes and the heel. When drawing the foot in the front view its important to note that all of the toes combined are not as wide as the actual foot. This is one common mistake many people seem to make when drawing in this view. To help you get the proportions you can draw some lines to indicate the width of each toe. 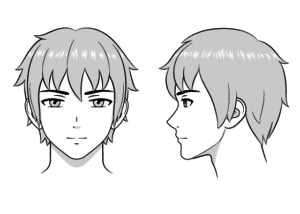 Do this before drawing the details. When viewed from the back the heel portion of the foot will be wider towards the bottom and narrower towards the top. Draw the overall shape of the back of the foot with that in mind. Draw a curved shape on each side of the back of the foot above the heel to indicate the bones. Be sure to draw the bottom of the heel with a light curve. Next draw the front part of the foot (it will be partially covered by the back of the foot). The toes will not be visible in this view as long as they are resting on the ground and the foot is close to eye level (like the example in this tutorial). Finally you can also draw a line above the heel to give a hint of the Achilles tendon. This tutorial covers some of the basic views/angles you can draw feet in. Of course there are many more. If you are having trouble you can always use real feet as reference. 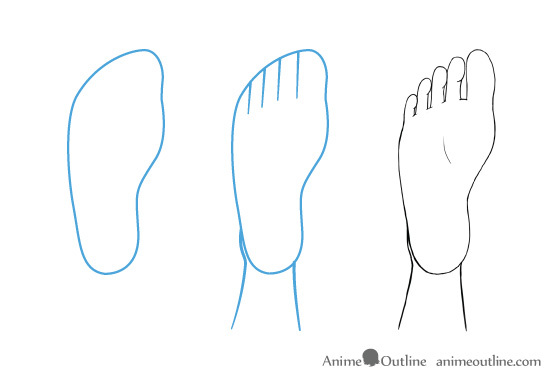 For more information on drawing anime and manga feet you can check the How to Draw Anime and Manga Feet in Different Positions tutorial. 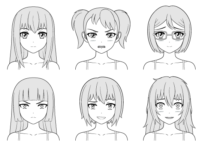 Should You Buy a Pen Tablet for Drawing Anime and Manga?